Barbecue is a fatty cut of meat that has been cooked at a low temperature for a long time, and that’s about all everyone in the smoked meat game can agree on. But while “pork vs. beef” is the Stones vs. Beatles of barbecue debates, there are deeper cut arguments raging in the ‘cue world -- think “1970s German experimental rock band Can vs. other 1970s German experimental rock band Amon Düül II.” Of course, the more obscure your point, the more fun the argument, so dive into these debates and give yourself some meaty conversational fodder. Modern commercial feedlots have shifted beef and pork in opposite directions. Meat from corn-fed feedlot cows has significantly more fat marbled into it than meat from its traditionally raised counterparts. Conversely, the modern pork industry has largely worked to raise increasingly lean pigs, while smaller farms focus on raising heritage breeds full of fat and flavor. Small farms and farm-to-table restaurants are increasingly sought out by consumers, but barbecue evolved in a world where meat cuts were distributed socioeconomically. While the quality of meat from pastured animals from smaller scale farms is often notably better, most barbecue cooks who have honed their skills with feedlot meat face an adjustment curve dealing with the pastured meats that have flavor, texture, and fat profiles they aren't accustomed to. Learning to cook more expensive cuts correctly will actually require more trial and error than the mass produced stuff. 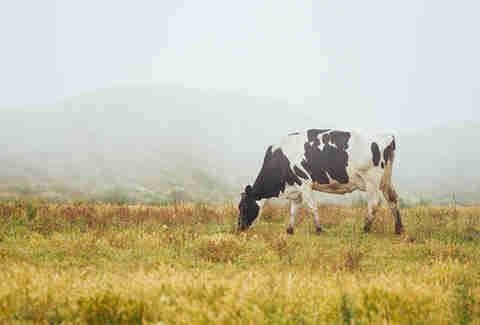 Eating small and sustainable is still a very noble goal. But in terms of great-tasting barbecue, the old dude who’s been cooking mass produced meats in a shack for decades is probably going to run circles around the young guy offering farm-to-table ribs. Well, maybe not “run” circles. Smoke versus gas is not just a grilling debate anymore. Of course, if you go to a big barbecue competition, charcoal and wood are religion. 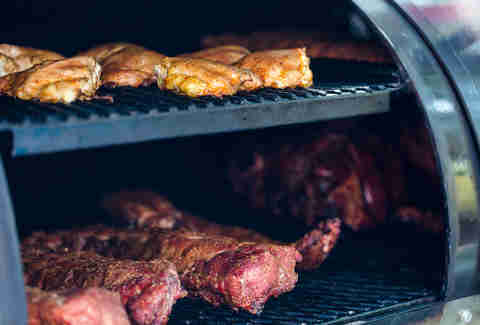 But a significant and growing number of barbecue restaurants swear by gas (or even electric) ovens, claiming that as long as you keep the oven full of smoke the results are the same: the smoke still penetrates the meat, providing delicious flavor while also generating the outer layer of bark that connoisseurs judge pitmasters by. Gas ovens provide a shortcut based on compromise, with room to place traditional wood in the path of the gas flame, and a thermostat to maintain constant temperature. While there are obvious practical benefits, going this route nonetheless requires cooks who are vigilant about maintaining the appropriate Willie Nelson tour bus levels of smoke; otherwise you might as well just use a crock pot. 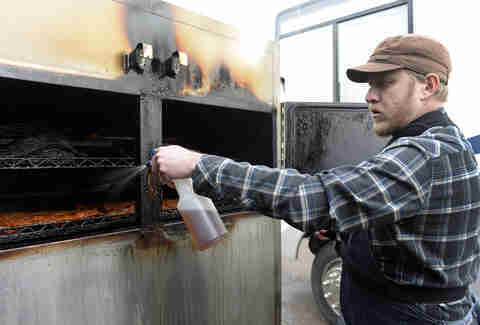 Even if those conditions are met, it’s still debatable whether or not barbecue perfection can be achieved with gas. But one thing’s for certain: any restaurant that doesn’t smell like wood smoke -- one way or another -- should be eyed with the same kind of suspicion as a muscle car with a single exhaust pipe. Perfectly cooked barbecue -- think beautiful bark on the outside with a pink ring underneath -- should be delicious enough to eat with no additional accompaniment. What happens next is really a matter of preference, but any additional seasoning should complement the flavor, not be the flavor. 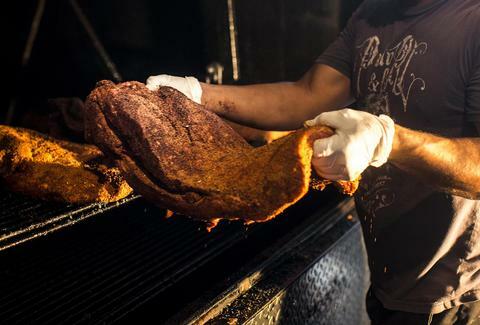 There are people, most commonly Texans, who claim barbecue doesn’t need any sauce. 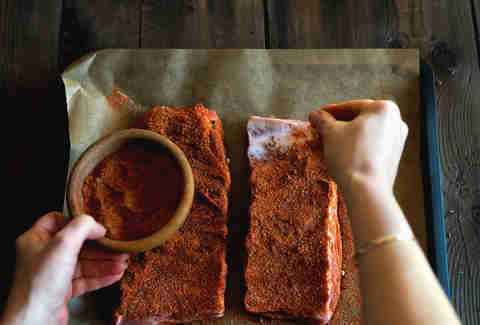 But a little sauce or dry rub can add a great extra dimension to great barbecue. However, when barbecue isn't cooked correctly -- when it doesn't get enough smoke or it is too tough -- sauce is a cover for the problem, not a solution. Just like over-hopping can mask the mistakes of an unseasoned craft brewer, drowning barbecue in sauce is a common trick to hide culinary criminality. Some barbecue cooks have outstanding sauces, so always give them a try -- you might find that they’re good enough to sop up sans meat, with a little bread. And plenty of people argue that you aren’t eating good barbecue unless you are wearing a generous coating of sauce on your face and shirt by the time you are done. But sauces in the barbecue world should be like a little makeup: a subtle accentuation of your best qualities, not something you cake on to make yourself a new person/brisket. Despite all the talk about tomato-based sauces and vinegar-based sauces as two conflicting camps, most people use a combination of both as their foundation. Most of the time, the debate is a matter of degrees. The bite from vinegar is an important element to pair with the flavor of smoky meat. North Carolina’s runny sauce is mostly vinegar, and sometimes mixed with mustard or mayo instead of tomato. But everyone who knows barbecue knows the tang of a little vinegar adds a special something to the mix. The big variables are the ratios of tomato to vinegar, how much sugar to add, and how much spice to add to heat things up. If there is one barbecue debate that is impossible to settle, however, it is sweet vs. spicy sauce. It’s so dependent on individual palates that even many long-time barbecue-cooking families can’t agree, while most restaurants don't even take a side, probably because they’ve got to serve both sides of those families. The notion that ribs should “fall off the bone” is less one side of a legitimate debate than it is an inexplicable and ignorant catchphrase that’s somehow gained a disturbing number of hack adherents. You can boil ribs in a pot of water until they fall of the bone, and sadly there are terrible “barbecue” restaurants that do just that. Barbecue comes from slow cooking meat, and when you take a bite of it you should know that it’s, well, meat. 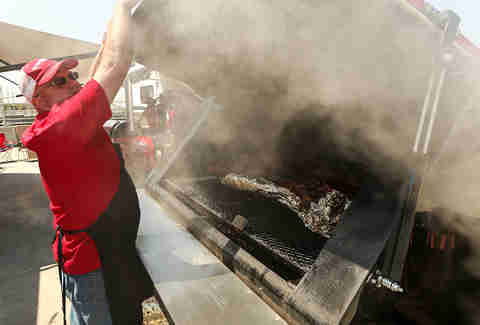 In barbecue competitions, one of the big factors is the “pull” of the meat. It shouldn’t collapse into mush like soft tofu but it shouldn’t make you lose a filling either. Perfect barbecue requires a firm bite before it melts in your mouth. 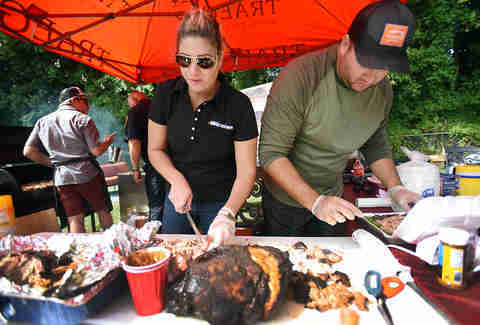 Formal BBQ competitions: helping or hurting? Competition normally leads to improvement, but there is an argument to be made that sanctioned competitions are not a true gauge of quality, and could actually hurting barbecue as a craft. Teams strive to pack as much flavor as possible into their food since the judges will only eat a few bites of it, and a few decimal places on a score can mean the difference between not making it into the finals or winning a grand championship and a check as hefty as the hog they brought with them. As a result, teams turn to whatever means of alchemy and witchcraft can make those bites shine, and it can result in flavor profiles that are way sweeter than anything someone would want to make a meal out of. Trickery like injecting meat to put more juice in it or using a curing rub on it before cooking to create an artificial smoke ring abounds. There is supposed to be something simple and honest about great barbecue that gets lost in the competitive frenzy. So when it comes to restaurants, don’t look for trophies on display. Look for lines of repeat local customers.